Press Eye - Belfast - Northern Ireland - 30th July 2018 ''The Secretary of State for Northern Ireland, Karen Bradley MP, is pictured with Mayor of Derry and Strabane John Boyle and John Kelpie, CEO of Derry and Strabane Council before a meeting to discuss Derry City Deal. ''Photo by Kelvin Boyes / Press Eye. As candidates put themselves up for election, FSB is urging them to put ‘business’ at the core of their actions and policy-making. To plagiarise JFK, ask not what business can do for your council, but what your council can do for business. 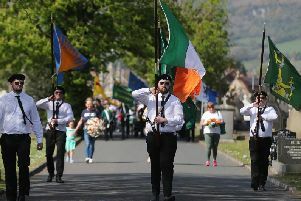 Within the last four years, people in Northern Ireland have voted in four elections; two to elect MPs to the UK Parliament at Westminster and two to elect MLAs to the Northern Ireland Assembly; and that’s before we count the by-elections which we have had along the way or, indeed, the seemingly all-engulfing Brexit referendum which has taken up the bandwidth of politics across the UK and Ireland. In slightly more than four weeks’ time we will be going to the polls again, this time to elect representatives to our local councils. This is the first local government election since the new ‘super councils’ have been fully operational. While the reform that followed the Review of Public Administration, which shrank our pre-existing 26 councils down to 11, has brought some positive benefits, there is still much progress to be made. There is a justifiable degree of dissatisfaction with politics, given that the last Assembly election in March 2017 has yet to deliver a functioning devolved government but during the political impasse, which has lasted more than two years, necessary action on infrastructure, skills and enhancing rates relief has not been taken. However, it would be wrong to allow this frustration to lead to disengagement with politics in general. Citizens, and perhaps most importantly, business owners, should continue to engage with policy makers. As the posters go up on the lamppost, leaflets come through the letterbox and canvassers appear at the doorstep, we should consider how the various policy priorities and ideas for the local area will impact your business, for better or for worse. For our part, as the voice of SMEs, FSB will be producing our own local government manifesto outlining areas where policy improvements can be made to help small business flourish, on issues where councils have responsibility. While we will publish our manifesto in full soon, a key ask will be focused on improving the planning process, to make it more efficient, streamlined and geared towards increasing economic activity in the local area. Planners should approach applications with a ‘how can we make this work’ approach, rather than ‘this can’t be done’. One area where councils need to put their own house in order is in relation to paying businesses promptly. Much has been made recently regarding larger businesses treating firms in their supply chain unfairly, but local government must also ensure its performance is up to scratch. In 2017-18 in Northern Ireland, only 48 percent of invoices were paid within ten working days by the local councils and 17 percent of invoices were still not paid after 30 calendar days. Our councils should be beacons of best practice in this regard, and should not be creating unnecessary difficulties for the SMEs which serve the community – hence the need to ask what councils can do for business. And in the spirit of councils working with business, the recently approved Belfast Region City Deal featured collaboration by six of our local councils, central and regional government, the private sector and universities. This will bring a bespoke package of funding and decision making powers with the aim of harnessing additional investment, creating new jobs and accelerating inclusive economic growth. Going forward, this collaboration should form a blue print to other initiatives, demonstrating what can be achieved as different stakeholders from the public and private sectors work in partnership. FSB successfully lobbied the UK Government for the Belfast Region City Deal to be introduced and we continue to urge progression of a City Deal for Derry/Londonderry City Region. It’s crucial as the City Deal projects progress there is a key role for SMEs within them to maximise regeneration and social benefit. As we approach the local government elections, we must focus on what councils can do better to improve the local economic environment for small businesses. Sometimes it may be the case that councils can offer additional support and guidance to SMEs; on other occasions it may be a case of removing barriers, speeding up processes and trimming down unnecessary red tape. Above all, we hope that prospective councillors listen to small businesses, recognise their role as the drivers of the local economy and place their needs and concerns at the heart of local government.